Each week, I make a few staples: sprouted hummus, yogurt, mayonnaise, and long-simmered bone broth and bread. It’s these staples that provide a dependable rhythm in my kitchen, around which I build our meals, a schedule, and a budget. This routine brings a bit of sanity and balance to what can, more often than not, be chaotic between satisfying everyone’s weekly schedule of appointments, sports, music classes, playdates and the unexpected. Lately, this Milk and Honey Sandwich Bread has replaced our usual no-knead sourdough loaf. We toast it in the morning, then spread it with butter and honey and sprinkle it with cinnamon sugar which we playfully call Fairy Toast. Or, I slice it thin, and slather it with avocado oil mayonnaise, stuffing it with fresh vegetables and sliced deli meats, making a sandwich for my son’s school day. It’s a pleasant bread, offering a light milky, whole wheat flavor with notes of honey and oat. Out of the oven, its mahogany brown crust crackles, and when you slice the loaf, its crumb is soft and creamy. And while it’s a bit less spongy than the store-bought sandwich bread, I find the value in producing my own loaf at home to be far more satisfying and palatable. 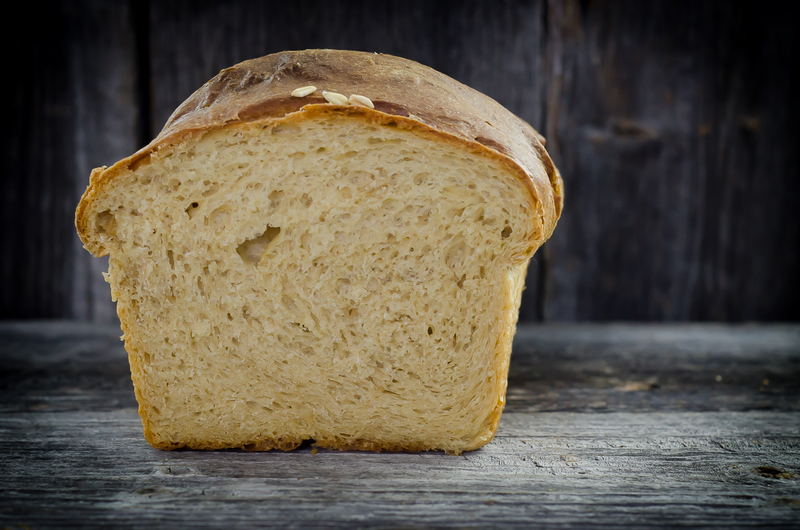 Soaking flour overnight in a liquid like water or milk does a few things to improve the quality of your bread. Soaking flour helps to release food enzymes naturally found in whole grains, and these food enzymes help to break down components of your whole grains, like food phytate, that can make grains, flours, and breads difficult to digest or lightly bitter. The result is that, by soaking flour, you make bread that’s naturally slightly sweeter, that’s easier to digest, and softer in its crumb. It’s a process that takes a touch more planning, but it is very worthwhile. Unlike white flour, for which it’s easily confused, white whole wheat flour is simply made by grinding the white wheat berries into flour. It’s the whole grain, nothing more and nothing less. White whole wheat flour is pale in color with a softer flavor, but with all the benefits you would associate with a whole wheat flour. 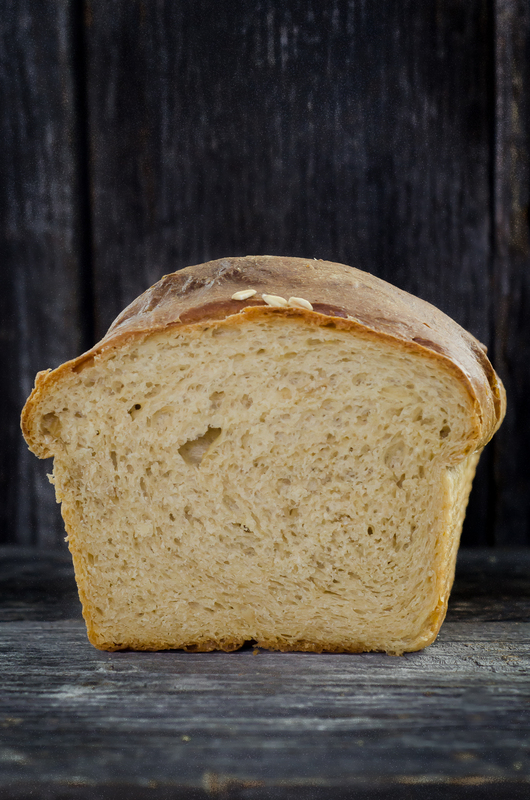 For these reasons, it makes a particularly good choice for a homemade sandwich bread: light color, good flavor, and soft crumb with all the vitamins, minerals and fiber of whole grain. You can learn more about baking with white whole wheat here. I know that many of you have concerns about wheat production in the United States. Perhaps you’re concerned about sustainability, regenerative farming practices or the overuse of pesticides and desiccating agents. I know that I certainly am. It’s easy, in the face of concerns like these, to throw up your hands in exasperation. For my part, I think it’s best to support those growers who are doing the right thing: growing with ethos grounded in transparency, sustainability and accountability. This is one reason why I recently started working with King Arthur Flour, who is on the forefront of identity-preserved agriculture. I’ve often tucked away their flours in my pantry – pairing their wheat flours with other grains like einkorn, barley, and spelt. It may not be a term you’re familiar with quite yet, but identity preservation helps to connect the food you place on your table directly with the field in which it was grown. Next to buying directly from a local farmer, buying identity preserved products gives you traceability from the field and farmer right down to your plate, and you can learn more about that process here. You can buy identity-preserved white whole wheat flour here. Working by hand, whisk flours together with ½ teaspoon instant yeast in a large mixing bowl with a tight-fitting lid (like this one), and then stir in the oats. Stir the water and milk together, then pour the liquids into the dry ingredients, stirring to create a loose, shaggy dough. Cover the mixing bowl tightly, and allow the dough to rest at room temperature at least eight and up to twelve hours. Dump the dough into the basin of a stand mixer (like this one), and then beat in the butter, honey, salt, and the remaining 2 tablespoons yeast. Continue beating all the ingredients together until they form a smooth dough, and then turn it out on a very generously floured surface. Knead by hand for ten to fifteen minutes, incorporating additional flour as necessary to keep dough from sticking, and kneading until the dough becomes smooth and elastic. Using a pastry brush, gently brush the top of the dough with cream, and then scatter one tablespoon rolled oats over each loaf. Transfer the loaves to the oven, and bake 5 minutes at 400 F. Then reduce the temperature to 350 F and continue baking until the crust is a dark brown and the bread reaches an internal temperature of 200 F about 45 minutes. Remove from the oven and allow the loaves to cool in their pans for five minutes, then turn out onto a wire rack, allowing the bread to cool completely before slicing. Do you measure the flour? When I made this recipe using ounces (4.5 per cup) my dough came out like batter. Of course you measure the flour. When I read that you “made this recipe using ounces,” I realize that you made conversions to the recipe which likely account for why the dough didn’t turn out the way it should. When making a recipe, especially for the first time, it’s important that you follow the ingredients and measurements exactly, and that you follow the instructions without making modifications. Sarah, there is an additional 1 1/2 cups of flour added the next day which is not listed in the ingredients. The dough does look batter-like before you add this mystery flour which you knead in to the mixture. After this, it does look like bread dough. Did you cut the recipe in half? 4.5 ounces is not a cup. 8 Oz is. I agree that at least the first time, recipes need to be respected and followed exactly. With that said, consider clarifying your explanation to this misled reader that a cup of flour is indeed 4-4.5 oz when weighing. 8 oz per cup refers to liquid, not dry ingredients! An 8 ounce cup is an accurate liquid measurement. A cup of flour is roughly 4.5 ounces. This recipe sounds awesome. However, I do not have the strength in my hands to do kneading for any length of time. Can this recipe be converted to use in a bread machine? I recommend making the recipe exactly as it’s described. You can try to convert it to a bread machine recipe and let us know how it goes. Can you share your thoughts on using yeast? 🙂 Thank you~! I’m not sure what you want to know, or what you’d like me to address. 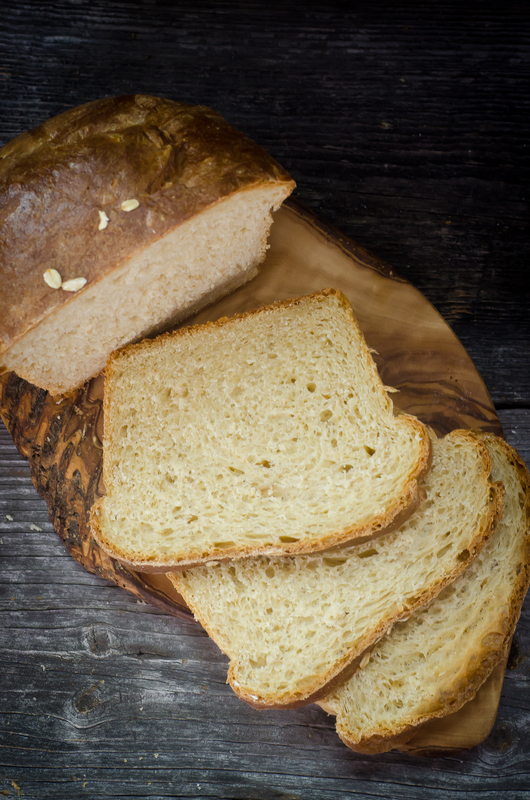 Can you substitute Einkorn and Dinkel for the whole wheat and have the same results? I only have those berries on hand at the moment. Also, I do not have flocked oats, only oat berries that I grind. Is that ok? If I grind them to a size like one uses for cream of wheat will it come out the same? Or should I just omit the oats? I recommend making this recipe using the ingredients listed and following the instructions exactly, making no substitutions. I was just about to make this when I realized the directions say to leave at room temperature. Milk at room temperature for 8-12 hours, doesn’t that make it taste bad? 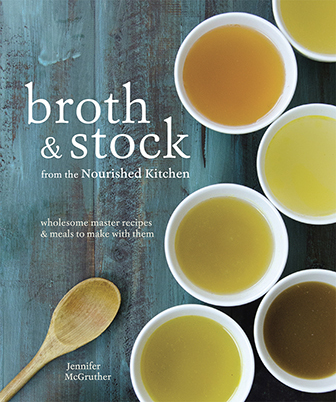 Where is the Long Simmered Bone Broth recipe? When I click on it nothing happens. The other sited recipes are fine. 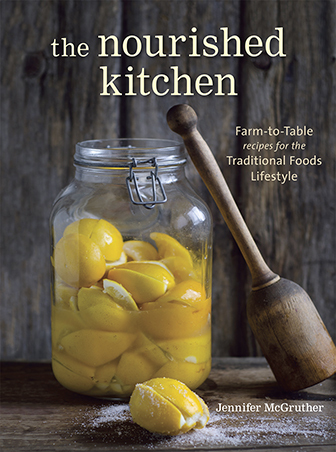 It’s in the cookbook that is listed when you follow the link. I’ve got this bread coming out of the oven right now! I followed the recipe except using the Einkorn and unbleached AP flour. It looks great and the recipe has been super easy to work with. I’m very excited to make sandwiches for the week. I’m wondering if this will freeze well as two loaves are too much to get eaten at once at my house. We usually freeze one loaf and then eat the other during the week. Is this good for bread machine baking converted cutting reciepe in half? I have not read the questions so please excuse me if this is a repeat question Would it be possible to do this in my bread machine? Would I have to make any significant changes? This is not a bread machine recipe. You could try to adapt it, and let us know how it goes. It’s very, very similar for sure! This is one of the things that attracted me to the recipe in the first place. I love sourdough. What part is “the short end” mentioned in step 5? I am a bit confused by this part of the recipe. This my first time making bread loaves by hand and not in a bread maker! Thanks! You’ll roll the dough into a rectangle. Rectangles have two long ends and two short ends. You’ll stand in front of one of the short ends, and then roll it tightly, to meet the other short end, so that the bread dough forms a tube. Awesome! It can be a little tough to describe, but I’m glad it helped. My bread came out dense and did not have the rise it shouldve..what are some possibilites as to why it came out like this? I followed the recipe and instructions to the best of my knowledge and ability. I will keep trying but it would help if I knew where to start with what I might have done wrong..? There’s many factors that can influence density of bread. Whether you added too much flour during kneading, whether you kneaded it too little, or too much. Whether you overproofed or underproofed the dough, and rising times are affected by the relative moisture and temperature of your kitchen, too. So I tried using my Bosch bread mixer for the hand kneading part and it worked great! I did the gluten test where you stretch about half a cup of dough in a square to make a window pane. If the pane doesn’t break, the gluten is developed. I think I only mixed it 4-5 min. So happy this worked! Thank you so much for educating me and the public on flours and the traditions of bread making. I never knew the nutrition values of sourdough starters and with your guidance, I feel confident to begin. With that said, this bread looks divine! One question: does the soaking of the high extration flours used in this recipe yield the same nutritional benefits as a sourdough starter, given this recipe uses yeast as opposed to sourdough starter. To clarify, this bread does not use high-extraction flours. It uses bread flour (which is low-extraction) and whole grain flour (which is 100% extraction). To answer your question about soaking: Soaking flour, as in this recipe, supports similar, enzymatic changes to those that occur in sourdough fermentation. This is why the crumb becomes softer and very slightly, sweeter than one that isn’t soaked. Theoretically, because of those enzymatic changes (namely the release of food phytase which mitigates the presence of food phytate), will help the minerals in the whole grain flour to become more bioavailable. I say theoretically because there was one study done on soaking in dairy products that found that dairy products, like milk and whey, did not support increased bioavailability of minerals. This is a nonissue for bread flour (and other flours with low extraction) as the minerals and food phytate rest within the grain’s germ and bran which have been sifted out and removed from low-extraction flours. There is one benefit of sourdough that would be missing in a recipe calling for soaked flours, like this one, and that is that the fermentation process increases folate and other B vitamins which, to my knowledge, doesn’t happen when grains are soaked overnight. TLDR: Soaking will convey some, but not all of the benefits of sourdough fermentation. This bread is about the best WW bread that I have ever made. It slices perfectly and tastes wonderful. I followed the recipe exactly, and also added King Arthur whole grain dough improver following KA directions. I’m so happy you liked it! We’ll look into KAF’s whole grain dough improver, too. I made this today and it’s delicious! Had great depth of flavor and the bread is soft. Great recipe! I’m making this right now for the third time. The first time I thought I’d done something wrong because I had to add so much extra flour the second day but it turned out really well so it was all good. The second time I did do something wrong and was in a hurry anyway so it wasn’t as good. This time is much like the first. I did have to add about 2 cups of flour this morning but it’s beautiful so far (waiting for the oven to preheat). Also, I did three loaves this time rather than two and they are just going nuts. Hi Pam, in testing the recipe multiple times, I find that those using a standmixer for the first step of mixing the dough that soaks overnight will typically need to incorporate more flour when they knead the dough the next day. It is very important to knead the dough on a generously floured surface to get the best results. This is in my oven right now. I did find that 2 Tbsp yeast gave me extra-exhuberant dough… required less than half the rising time mentioned in the recipe. I had to hurry along a sourdough loaf I was baking first to get these in the oven before they exploded. Maybe it’s my climate – but next time I’ll either cut back on the yeast, use bigger pans or less rising time. Thanks for sharing what is hopefully a great bread recipe! Corse sea salt or fine? This bread is really great. It has a very nice flavor, and a great crumb! Used my stand mixture for the kneading. I’m used my paddle attachment of my kitchen aid, 5-7 min on medium and I added around 3/4 C of flour. My husband really liked it, and he won’t be at any wheat bread. This bread is wonderful! I have the privilege of being married to an avid bread baker, and this has been his go-to recipe for the last few months. We don’t own a stand mixer, so my husband kneads it by hand. He’s very strong, so we learned that he doesn’t have to knead the whole 15 minutes or he’ll overwork the dough. For some reason, this recipe always produces enough for three loaves for us. (The first time we baked it as two and they were enormous!) This bread has such a lovely flavor and texture. We eat the first loaf hot (almost all at once, it’s so good!) and we let the others cool, and then wrap them in plastic wrap and freeze them. We go through about a loaf a week. Thanks for the recipe. I have always found your recipes to be very reliable. This is a wonderful bread! Excellent crumb, nice and soft like a sandwich bread. The flavor is rich, with a bit of a tang. I used my kitchen aide flat beater to knead it. It took about 7 min to get to the window pane stage. Thanks a million for this recipe! I finally have created a bread with whole wheat flour that rises well and is beautiful. So grateful! I love the soaking! Easy peasy. Now is this still considered a dwarf wheat? Wondering why my loaf turned out pretty dense? It did rise both times quite nicely, but the end result was still a little “heartier” than I would have liked for sandwich bread….any ideas? If it came out dense, it’s most likely because you added too much flour in kneading or you overproofed the dough. Using All Purpose flour instead of bread flour will lighten it up ???? How does this technique differ from autolyse? Autolysis os a process, not necessarily a technique, but this technique (soaking) definitely leans upon autolysis. Looks like a GREAT recipe! 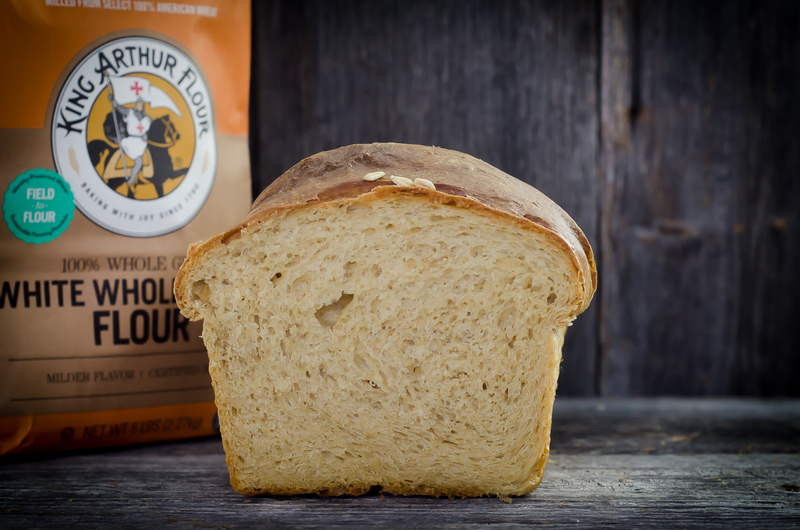 I just wish King Arthur had organic flours…. My husband can’t have milk. Can I replace the milk in the dough with more water or maybe almond milk? Hi, you advise to keep the shaggy dough for 8 and up to 12 hours, but can it be kept any longer- refrigerated or at room temperature? Is “instant yeast” the same as “active dry yeast” ? Thank you! No. Instant yeast can be mixed straight in, while active dry yeast should first be proofed. This went perfectly! I used All Purpose Flour in place of Bread Flour and let the flour soak for more like 15 hours before I kneaded it. I also let my Kitchen Aid Mixer do the kneading. It did need almost a full extra cup of flour during kneading to get rid of the stickyness if you go the same route. I love that the required internal temperature is listed, it makes it so much easier to not pull it out too early even through the crust was darker than in the authors picture. Definitely entering our usual rotation! Thank you for this great recipe, I am excited to try it! I have one question, regarding the soaking: Are the same health benefits (deactivating phytate within the whole grains) achieved through soaking in milk/water as in soaking in a slightly acidic liquid solution? I had always understood acid to be necessary to break down phytate, Does the milk sour slightly as it sits at room temperature, to create some acid, or is acid not necessary to help that chemical action to take place? I’m not sure enough research has been done to fully analyze the breakdown of phytate in soaking in milk, water vs something slightly acidic. That said, the milk does sour slightly as it sits, but there’s some evidence that soaking with dairy (including whey) doesn’t effectively mitigate food phytate. Phytic acid is a complicated issue, and I think it’s important to recognize that it has a lot of benefit as it’s strongly anticarcinogenic, and has a handful of other benefits, too. In an otherwise nutrient- and mineral-rich diet, I’m not too concerned about the effects of phytic acid. That’s a change in my position that I’ve come to over the course of 2-3 years. I have a local source for Spelt berries which I grind for bread. So I would like to make your recipe and use the spelt flour, hope it works for me! Let us know how it goes! Hydration levels may differ from flour to flour, so there may be a few adjustments you need to make. Jenny– I still don’t understand what identity preserved flour is. I looked at King Arthur’s website and it doesn’t say anything about using non GMO wheat or that organic wheat was used for their flour. That is what I am most concerned about. So my question is: is King Arthur flour non-GMO and/or organic? I’m happy to clarify as best I can. First, there is NO GMO wheat on the market (despite the misinformation you may have read). You couldn’t buy it at this time even if you wanted to. So, all wheat is non-GMO, including King Arthur Flour’s. Identity preservation means that from field, to flour, to your grocery store, the flour is traceable. I like in Australia and don’t have access to the White Whole Wheat Flour do you think it would be possible to make with our flour that is approximate to you whole wheat flour. I think that should work fine, though you might need to watch the hydration as that can differ from flour to flour. Can i substitute whole wheat flour for the white whole wheat flour? I ran out of Whole White Wheat flour not too long ago and only had Whole Wheat. I used it and several loaves later, still using it, my loaves are just as delicious, light and beautiful as with the white wheat! What brand of instant yeast do you use? I looked at my Red Star bottle and realized that it contains an additive. Can you recommend a brand that does not contain additives or preservatives? Karen, SAF brand yeast is a good one to try. I just finished baking my loaves and the bread is wonderful. We could not wait for the bread to cool, and had a slice each with lots of butter on top. So good! During the first rise, is the dough supposed to be covered tightly or lightly? We cover the dough tightly. I finally purchased King Arthur’s flour. Thank you for sharing that bit about them, as I hadn’t realized they were on the forefront of such a wonderful movement. I am wondering why you tightly seal the dough? I haven’t done this in the past and am curious why you do? It’s not a huge factor for me, but is more of an educational curiosity. Thank you for your beautiful recipes! Tightly sealing the dough in a bowl that allows for ample space to rise will prevent the dough from drying out, a problem in arid climates and in homes with central heat. Hi Jenny, thanks for this recipe. I’ve been toying with the idea of adding a bread making day to my week and have been trying to decide between getting and feeding a sourdough starter or making a yeast bread like this one. My concern is the health aspect plus the work load. Knowing myself, I won’t be able to create the habit of making bread if it’s too much work or takes all afternoon so i’m worried about having to maintain a sourdough starter. But on that same note, I know a sourdough bread is easier to digest. Do you have any thoughts on the digestability of this bread? Sometimes I wonder if it’s actually preservatives and over processing of store bread that make me feel icky as opposed to gluten. Jenny, my friend and I plan on making this bread but we don’t have a stand mixer. Any Suggestions? You could try to make it by hand, but the hydration seems to be different. I need to re-test by hand. I love your site and use it frequently as I’m learning more about cooking nutritious meals! Could you refer me to instructions on soaking the flour overnight before baking this bread? Thank you! Ok… I got it…I thought the instructions for soaking were not included in the recipe. I made the bread today and it is the best (non-sourdough) bread I’ve ever made!! Thank you. Hi! I know you said to not substitute any ingredients, but I do not have access to raw milk. Should I forgo this recipe or could I try water in it’s place? Thanks! You should be able to use pasteurized milk just fine. I just wanted to share that I made this yesterday for Imbolc, but I didn’t knead it and dropped loosely-formed balls into a muffin tin to make rolls and they turned out beautifully! What a lovely idea to turn them into little rolls! This is a perfect bread for Imbolc with all that milk, isn’t it? We did a version that included several seeds, too. Hi Jenny, Ever try this recipe with all white wheat omitting the white flour? I grind my own berries and am interesting in trying this recipe with all white wheat. Thanks! Can you use sprouted white wheat flour in this recipe, or does the soaking for 8-12 hours of the flours listed have the same effect? You could try and let us know how it goes. Soaking offers some of the same benefits as sprouting does.